Koral is a reflection of Caroline Rivière. You can immediately see the influence of Caroline’s life in New Caledonia in the South Pacific in this piece. She captures the textures of the coral reefs and the opposing smoothness of the 18K gold enveloping the amethyst quartz. Caroline studied jewelry in Montreal, and this experience is reflected in the design sophistication and attention to detail. This breathtaking piece of contemporary jewelry is a statement unto itself. This bracelet was made entirely by hand from a silver plate, which I sawed off and textured. Tell us about the inspiration for the piece. The bracelet is inspired by the shapes and textures of South Pacific coral reefs. It is the first time I made a big gold part of a piece. I learned a lot about how to work this metal. Yes, this piece inspired a series of jewelry that flows from this design. Yes, I already have other design ideas to develop. I love the contrast between the yellow gold and oxidized silver. Initially, I was hesitant to oxidize it, but the impact between polished silver and yellow gold was really not the same. Yes, I myself tried it on as well as others. It sits very well. It has a very delicate and feminine look. I live in Longueuil, a suburb of Montreal. Where and when did you study? I got my degree in jewelry in May 2015. During my first maternity leave in 2010, I started making jewelry in resin. It is at this point that I discovered I had good manual skills. At the time, I intended to have a career in science, since I was studying marine biology. It was during my second maternity leave in 2012 that I decided to change careers. 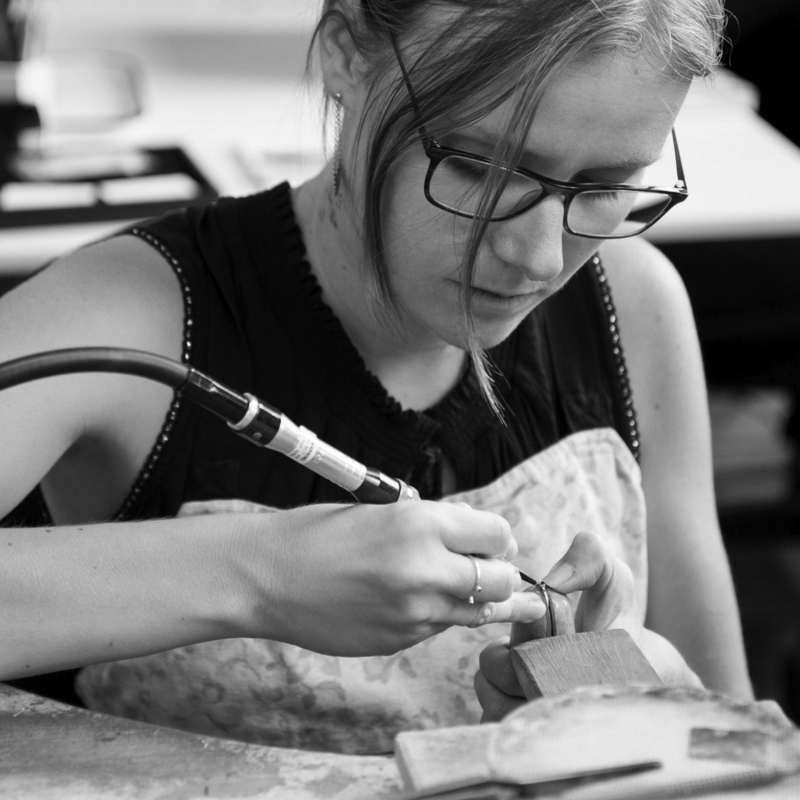 I therefore enrolled in the École de Joaillerie de Montréal (School of Jewelry in Montreal). It is now almost three years since I graduated from the École de Joaillerie de Montréal and started my own business. I grew up in New Caledonia, an island in the South Pacific. Diving has always been part of my life, and the seascapes I saw throughout my childhood strongly influence my creations. Before the jewelry, I was studying marine biology at the Université du Québec à Rimouski (University). I have a lot of ideas overnight, but it's morning when I prefer working. My company is called Caroline Rivière Joaillerie. What do you sell? What services do you offer? I sell unique pieces and limited-edition jewelry. I also regularly have private orders. How do you get the word out about your work?" By social networks, mainly Instagram. Do you have a staff? I really like working with gold and precious stones. What I like the most is creating a piece from scratch, transforming the material into a unique piece of jewelry. Trends do not matter much to me when I create a piece of jewelry. However, as fashion surrounds us, it can be that it influences me a little more than I know. The superb brightness offered by the big windows in my workshop. I would like for it to be closer to me. The tool I could not do without is my Foredom. Yes, most of the time I listen to music. Mostly classical music or film soundtracks. I also like to listen documentaries while working. Do you really want to do. Don’t be afraid to think big. I really like the work of German Kabirski. So if I had to choose I think it would be him. I was very grateful and proud to know that I got second place. I just began my career in jewelry, and it's a great opportunity and honor for me. Several people advised me to participate. However, it's Stéphane Blackburn, the Director of the École de Joaillerie de Montréal, who encouraged me to go further. In 2016, I won the Niche Award. In 2017, I won the Best One of a Kind Award at The Earring Show in Vancouver. And I've also been a finalist or won other local contests.